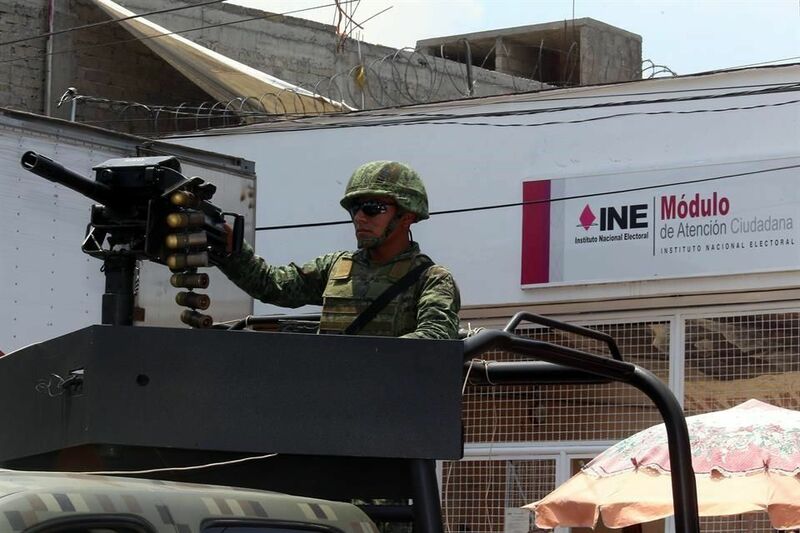 As I write these lines, the State of Oaxaca, Mexico is being occupied by a combination of army, navy and federal police Units. Some 7,000 troops are being sent in order to guarantee the right to vote in the midterm elections for a Congress that will continue to get high on the government hog while leaving the rest of us to deal however we can with the effects of the nation’s ongoing disintegration. President Enrique Peña Nieto needs the elections to go on as scheduled in order to maintain the charade that Mexico is a functioning democracy rather than what it really is, an autocratic narcostate on the verge of collapse. He needs the “legitimation” that a good electoral show can put on. Unfortunately, some wayward characters have decided to deviate from the script. Among those is the Sección 22, Oaxaca’s Chapter of the National Teacher’s Union. In recent days, members of the union have occupied the local gas distribution plant, causing gasoline shortages and gas station closures, have occupied the state’s 12 district election offices (3 of which have now been “liberated”), and have blocked the highway between Oaxaca and Mexico City, requiring the troops to land by plane. It pays to be a congressperson. In 2015, a diputado, or representative in Mexico’s Congress, earns 1,264,536 pesos a year, after taxes. This translates to 160,833 pesos (some $11,488 dollars) a month. Senators earn 2,729,099 pesos a year after taxes, some 262,337 pesos ($18,738 dollars) a month. These figures include the following benefits: four different kinds of insurance, a meal budget, savings fund, transport reimbursement, and a Christmas bonus worth 40 days of salary. The minimum wage in Mexico is between 68-70 pesos ($5 dollars) a day, or some $100 dollars a month. This is one of the lowest figures in the OCDE, and not enough to acquire a canasta básica of daily food intake. In its issue #1969 of July 2014, Proceso newsmagazine reported a special bonus of $300 million pesos paid out to Congressional parties that voted in favor of a series of reforms, including the crown jewel, the Energy Reform Bill that privatized Mexico’s lucrative oil industry. For his part, Ricardo Monreal, head of the Movimiento Ciudadano party in the lower house, reported having received $15 million pesos in unsolicited funds. When he tried to return them to the treasury, he was denied. The Mexican “partidocracy” will receive 5,356 million pesos in public financing this year. While the idea of public financing of campaigns is a good one in principle, parties in Mexico use this generous funding to maintain their stranglehold of the political process and lock other actors out. As there is no open primary process for selecting party candidates, party bosses tend to decide who receives the nominations, leading to a revolving-door rotation of many of the same names between the lower and upper houses. And although independent candidacies were finally allowed as of this year, would-be candidates are required to collect 1% of the nationwide voting roll to do so, some 780,000 signatures. This they are required to do in 120 days, with their own funds. This not to mention the deep pit of disrepute into which the National Electoral Institute (INE) has fallen. The Institute has been responsible for two fraudulent presidential elections in a row, those of 2006 and 2012, and has proven typically negligent in policing the actions of the Green Party – a satellite of the ruling PRI party – in its multiple violations of electoral law this time around. Its head, Lorenzo Córdova, was recently recorded making disparaging comments about indigenous people. And, incidentally, the 11 councilors of the Electoral Institute take home a cool 182,212 pesos ($13,015 dollars) a month while the actual poll workers are lucky to get a sandwich and a coke. But yes, the elections must go on. Unresolved killings across the country, the case of 43 missing students being covered up until it’s forgotten about, but the elections must go on. I will vote tomorrow, but I understand the millions of people who will abstain or spoil their ballot. Not everyone has as high a tolerance for farce as a playwright.